How to find The Southfield Hotel, Girvan, Ayrshire. We’d like to show you a Google Map with our location here but you need to allow cookies for us to do that, and then to refresh the page. The ferry crossings from Cairnryan to Larne and Belfast offer a chance to see Ireland with around 6 sailings a day to each port and a crossing time of around 2 hours. The Hotel is an ideal base for golf breaks, with over 30 superb courses in the Ayrshire area. We offer secure private car parking, and our location close to the town & beach offer many attractions including Girvan's long sandy beach & play area makes the hotel a popular choice for families. Dominated by the volcanic plug of Ailsa Craig, Girvan to this day remains one of the most beautiful and unspoilt seaside towns in the South West of Scotland with it's fantastic scenery and wealth of history on it's doorstep. The world famous Turnberry Lighthouse, with Ailsa Craig in the distance. 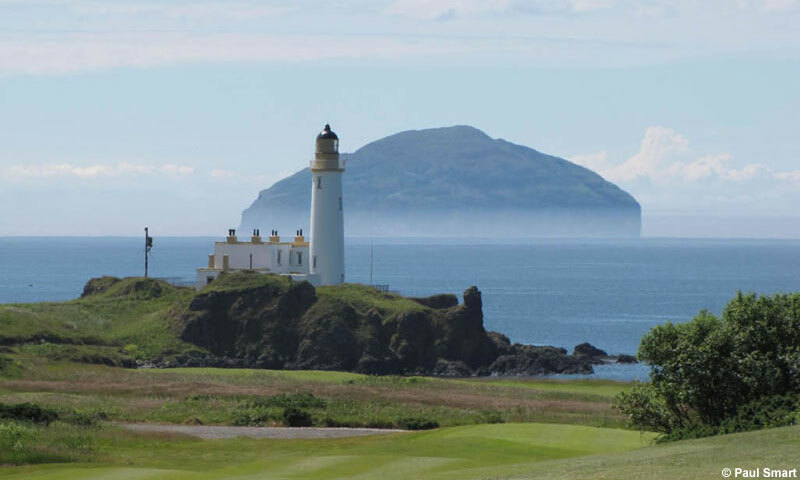 Turnberry Golf Course is a mere 5 miles North of Girvan.